The choice of first mobile platform to develop the app could be complicated. It is especially fair for startups and small companies with limited resources. The question here is not so much about the cost of development but rather about the cost of marketing, further improvement and support of the app. Hybrid app solution that lays on the surface seems to be the good one. The hybrid app can be instantly released on both platforms but this is only one side of the coin. This approach eases the development of the app but the other side is that marketing, support, and app improvement becomes more complicated in a long run. At BraveGeeks we don’t fancy an approach like that. Facing a choice between a hybrid or native app for each platform, we would surely go for the second option. The reasons behind it are well described by the guys from Lunabee Studio here. 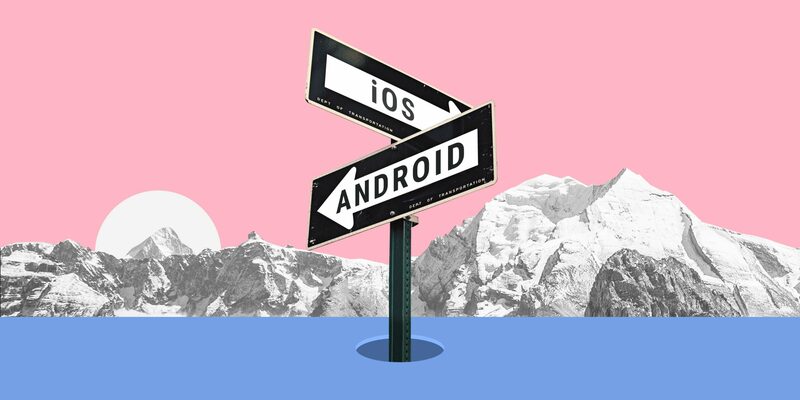 When it comes to a mobile platform to release the app on, many companies choose iOS first without giving it much of a thought. Technical specialists in the US and Europe like Apple products. Most of them use them so they are more likely to think that the rest of the people prefer Apple products too. However, let’s check if this assumption is correct. Let’s get started by comparing the market share of both iOS and Android in different parts of the world. Statcounter publishes open data about the market share of iOS and Android in US, South America, Europe and so on. According to this data, Android is significantly more widespread than iOS everywhere outside of the US. Moreover, even in the US Android has a larger market share even though the difference is not so dramatic. Let’s not get into the detail of the reasons behind it. Just take this data into consideration when defining the serviceable obtainable market (SAM) size for your app. Simply put: focusing on iOS as the major platform in the regions where Android dominates the market would most likely lead to losing money rather than earning it. Usually, another important metric is a paying capacity of a user. Here iOS leaves Android behind. 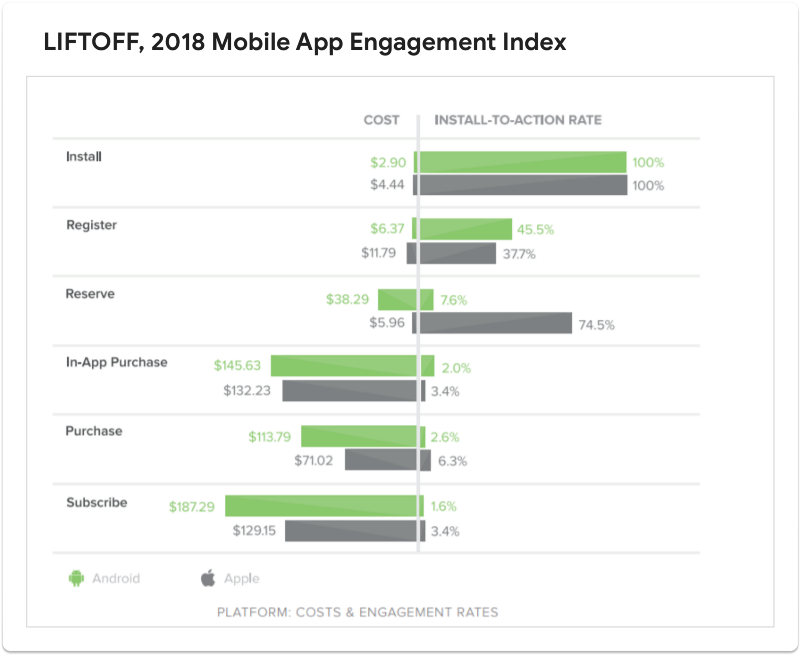 According to the LIFTOFF report 2018 Mobile App Engagement Index, iOS users are twice likely to purchase apps (6.3%) than Android users (2.5%). 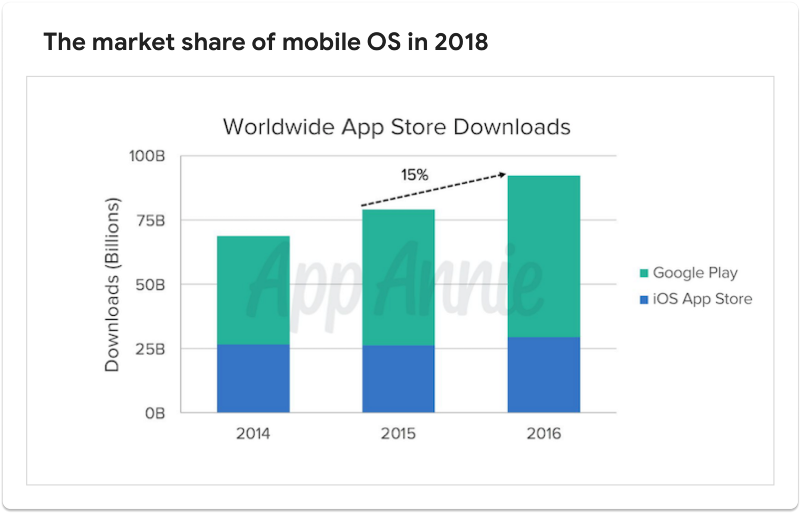 Keep in mind though that Android users are more likely to register in the app with a percentage of 45.5% which is 20.9 percent more than iOS. The same is fair when it comes to the user acquisition cost. And don’t forget that on average, iPhone users spend more then Android users. Wolfgang Digital research shows that Android users spend $11.54 per transaction. iPhone users, on the other hand, spend a whopping $32.94. It is easier to earn the trust of Android users. However, when it comes to actual purchasing, Android users become pickier and don’t spend much. If the app is not free or the monetization strategy implies in-app purchases, that might cause problems. However, Android would fit well the projects that work with ads, or follow a commission-based or other monetization strategies. Don’t look at this data as a precise metrics of your future application: it could help you in defining the hypothesis of Return On Marketing Investment (ROMI), but the real metrics of the specific app always differs and depends on the market, the app itself, marketing channels and so on. There are many apps on Google play that are developed without a needed precision: they are not well-thought and don’t follow any guidelines. However, there is been a major change in that matter in the past couple of years. 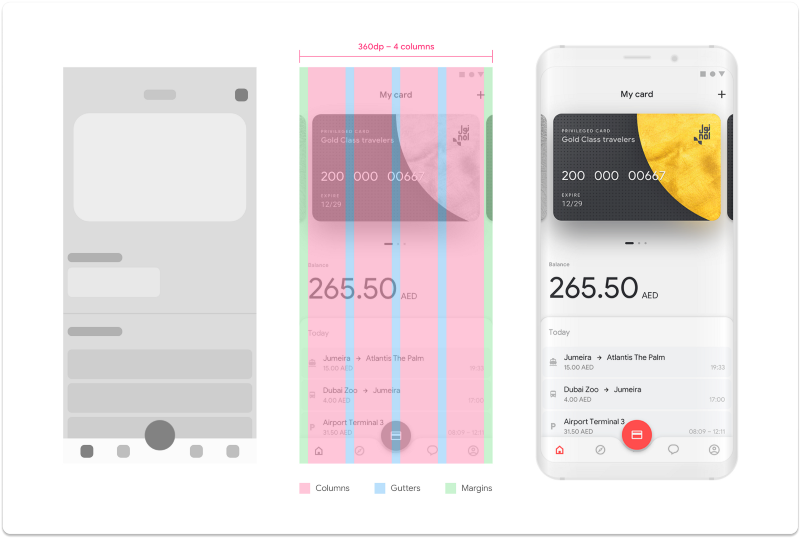 The year 2014 was marked by Google presenting Material Design that was significantly improved in 2018. Google also started updating its own official apps recently. The third-party developers are also gradually improving their apps by using the published guideline. It is well-structured and contains examples and best-practices. 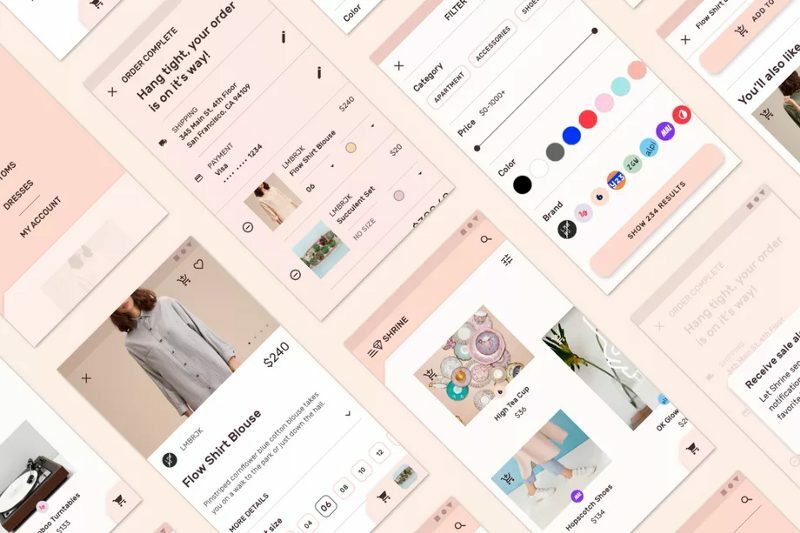 In order to help designers, Google recently launched Theme Editor — a tool to work on the design library according to Material Design guidelines. It helps to make changes to all the standard Material components automatically. 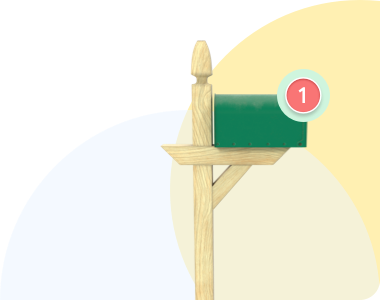 This creates a customized UI Kit that follows the guidelines completely. At BraveGeeks we recently did a redesign showcase of an Android app for public transportation by using the Theme Editor and latest (at the time we were working on it) guidelines. We were happy with what Google has done recently. Many developers are convinced that programming for Android is simply horrible. Indeed, as long as only 5 years ago development for Android was quite complicated. However, a lot has changed recently: many tools for developers were introduced, the libraries became more convenient to use, and documentation got more clear. 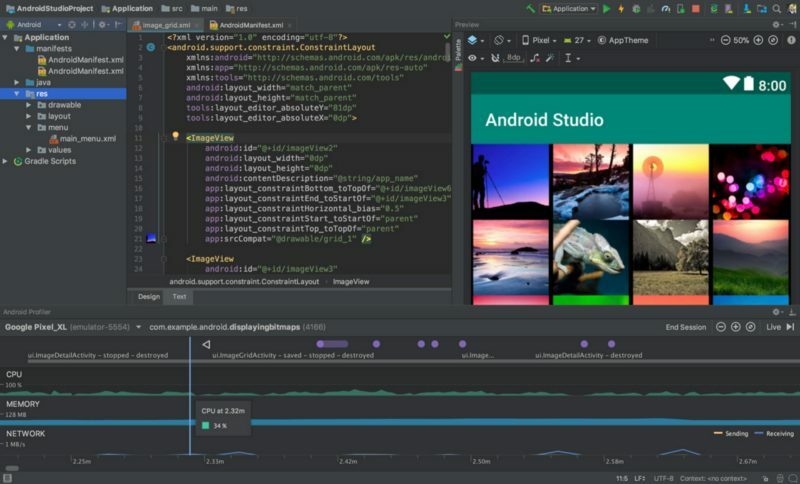 In 2014 Google launched Android Studio that was based on IntelliJ IDEA software. This IDE looks good, works fast, and is free. It is available on Windows, MacOS, and Linux unlike Xcode that only works on MacOS. Additionally, Android Studio supports Kotlin (we love it!). Android Support Library meets the main needs of a developer when it comes to the basic elements and components of the interface and helps support backward compatibility (one of the major challenges Android developers face). In 2018 this library was renamed to AndroidX and became a part of Jetpack which is a set of components for a developer for a quick start. The documentation got improved too: it became more detailed and well-structured. Even code samples and the best practices can be found there. Google is also developing and constantly improving a cloud platform called Firebase that helps launch products on Android. Firebase got a lot of different features starting from Push notifications to database cloud hosting and machine learning APIs. The standard Android app distribution method is Google Play. In 2018 it has improved significantly both in terms of design and architecture. Google improved UX of the marketplace, and developers got an access to a new format of publishing their apps called Android App Bundle. You can read more about that in this article. In general, Google Play expands rapidly in the number of downloaded apps. In 2016 the increase in the number of downloads reached 15% with 75 billion downloads, while the App Store recorded just slightly over 25 billion downloads during the same year. There are other markets for the distribution of Android apps. For example, Amazon and Samsung have their own stores and there are other ones too. Moreover, Android apps have a possibility of sharing apk file directly even though it is not so convenient for users. The choice of a first platform for the app depends on the available resources, type of the app, monetization model and the desired market of distribution. The US market definitely requires a release of the iOS app because Apple products quite popular there and their users have the highest paying capability. In case the product is mostly focused on the European, Indian or worldwide market, it makes sense to think about releasing on Android first. Especially if the app is free and not monetized directly. Android platform is highly underestimated so releasing an app for it could serve as a competitive advantage: it is cheaper to acquire users and, due to the last changes implemented by Google, the apps can be developed fast and easy.